Given the Florida Panthers’ putrid home attendance numbers, you might be surprised to learn that the team has offered up some of the most entertaining displays of the early season. Unfortunately, eventful hockey doesn’t necessarily equate to winning hockey. Saturday night’s 5-4 overtime loss to the Tampa Bay Lightning was a prime example. After jumping out to a 4-1 lead in the second period, Florida came apart at the seams and surrendered four unanswered goals. Through 25 games, the club ranks 11th in goals per game (3.24) and 29th in goals against per game (3.56). Those combined averages amount to a lot of action. No one could ever accuse Florida of playing a boring game. By that same token, no one should mistake the current Panthers for playoff contenders either. Their 10-10-5 record finds them in 14th place in the Eastern Conference. A team that low in the standings is typically outplayed on a regular basis. Oddly enough, that isn’t really the case with Florida. According to Natural Stat Trick, head coach Bob Boughner’s men control 51.9% of shot attempts (ninth) and 50.8% of scoring chances (14th) at 5-on-5. So why has it been so difficult for this squad to win games? For starters, the Panthers have the fourth-worst on-ice save percentage in the league at 90.7%. No. 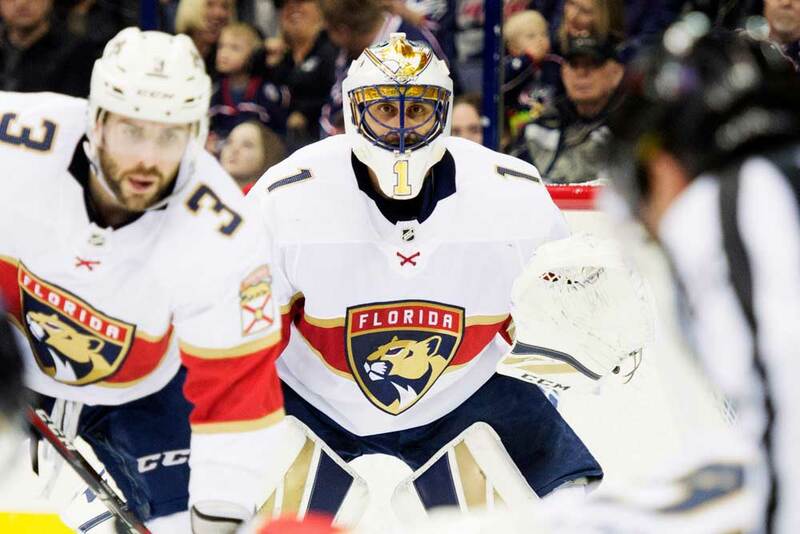 1 netminder Roberto Luongo has been sidelined for much of the campaign, forcing backup James Reimer to assume a larger role than he’s accustomed to or qualified for. He appears jittery and out of control in his crease, often dropping to his butterfly and seemingly hoping for pucks to hit him rather than working to track the puck. His 3.36 GAA and 89.3 SV% are without question eyesores. Even when Luongo has played, however, Florida hasn’t performed well. The veteran is 4-3-0 this season with a 3.07 GAA and 90.2 SV%. Those numbers are worlds away from his career averages (2.50 GAA, 91.9 SV%), which suggests that Father Time may have finally caught up to the 39-year-old. Naturally, the defense must also carry some of the blame for this sharp decline between the pipes. Though controlling play is great, even the best puck-possession teams must defend 40% of the time. This is where Florida falters. Its defensemen routinely make poor decisions with and without the puck, committing turnovers and jumping up for ill-advised gambles that leave teammates in the lurch. In tight contests, it’s not only the frequency of the mistakes but their timing that can prove back-breaking. It’s no shocker, then, that the Panthers’ win percentage in one-goal games ranks fifth-worst in the NHL. Keith Yandle and Alex Petrovic are the two guiltiest offenders on the blue line. First off, they allow far more shot attempts and scoring chances than their counterparts. Secondly, they’re careless in their zone, often losing 1-on-1 battles or outright failing to pick up their assignment. This is especially damning for Yandle, who sports the highest average ice time among Panthers defensemen. At this stage in his career, the 32-year-old can’t change his stripes: He’s a dynamic offensive defenseman with glaring holes in his two-way game. He would ideally be paired with a steady, defense-oriented player. 6’4”, 216-pound Petrovic should provide a good fit on paper, but he can’t be counted on. Instead of a no-nonsense approach, his performances are riddled with silly choices (holding on to the puck for too long, recklessly chasing opponents in the neutral zone, taking poor angles in coverage, etc.). It isn’t all bad on the back end. Aaron Ekblad continues to progress after a slow recovery from concussion issues. The 22-year-old is clearly the top dog on the blue line, using his frame (6’4”, 220 lbs), skill and smarts to suppress chances while generating some of his own. He isn’t a finished product, though, and could certainly use a mentor to show him the ropes. Alas, Boughner has slotted Mike Matheson next to him. While the third-year player has great wheels and decent offensive instincts, he’s prone to absolutely baffling, highlight-reel mistakes. Instead of enjoying a safety net, Ekblad is thus forced to become one for his shaky partner. Beyond the personnel’s shortcomings, Florida’s coaching must also be held responsible. The Panthers have no problems scoring. Jonathan Huberdeau, Aleksander Barkov, Evgenii Dadonov and newcomer Mike Hoffman are stellar talents up front, while Yandle, Ekblad and Matheson can contribute from the blue line. But once they find the back of the net, the club’s disposition changes. Boughner’s troops retreat into a shell rather than imposing their will on their opponents. As a result, the team’s win percentage when scoring first ranks dead last in the league. It comes in last when leading after one period and second-last when leading after two. By contrast, it ranks 13th when trailing after one and 10th when trailing after two. Clearly, the Panthers shouldn’t turtle up and pray for the best. Prevent defense essentially opens the door for comebacks. Their surest bet is to keep doing what’s been working, wearing the other team down until it no longer has the fortitude to climb back into the game. While that may seem obvious, merely trying to survive with a lead is a common tactic among bench bosses. Unfortunately, Florida’s blue-line corps isn’t built to hold on for close victories. It’s built to move the puck up the ice quickly and facilitate offense. It’s built to attack in waves. Reining that impulse in hurts an awful lot more than it helps. By playing to his players’ weaknesses, Boughner is simply rubbing salt in the wound. With all that said, there are reinforcements on the horizon. Luongo is expected to return imminently, and he’ll set out to prove that he still has plenty of gas left in the tank. Vincent Trocheck, who fractured his ankle on Nov. 19, should also be back before season’s end. The 25-year-old is a terrific all-situations center who tallied 75 points in 2017-18. He had 14 points in 18 games prior to suffering his injury. His return will improve the club’s center depth, team defense and special teams. Until then, however, the Panthers must dig their heels in to stop their slide (3-5-2 in their last 10 games). If they can’t reverse the tide, they may sink too deep for Luongo or Trocheck to save them. Good teams find a way to win. Bad teams find a way to lose. With porous defense, weak goaltending and blown leads, Florida is inching ever-closer to the latter category.